The town has undergone a transformation during the past thirty years which has witnessed the closure of virtually all the old heavy industries, the reclamation of derelict sites, and the creation of many environmental and tourist attractions. 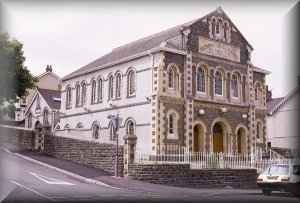 The Welsh Methodist Glenalla Chapel was built in 1909, with an extension to provide a schoolroom being added in 1914. Glenalla’s congregations dwindled after the Second World War, and continued to decline until it was forced to close in 1987. By the time closure came, the condition of the building had greatly deteriorated. The Chapel was bought by the Town Council in 1987, and in 1991 a full restoration scheme was completed to create a splendid Civic Hall which retains the quintessential character of the original building. The adjoining former Chapel schoolroom was converted into a community centre. The restoration scheme was recognised by a Prince of Wales Committee Award for the restoration of historic buildings. It is now registered by CADW as a Grade 2 listed building. On street parking. Wheelchair access is to the side. There is a stage in the Civic Hall. The hall and community centre each have a kitchen. Heating is included in the hiring charge. IT equipment is not provided. On the A484 through Llanelli, take the College Square exit at the Swansea Castle Roundabout, and continue into Glenalla Road.